Before I can start with experiment 1, I have to start from scratch with the collection of the materials which are needed to start experiment 1. The family of the homestay in Balikpapan are pro-actively helping me with every weird thing that I carry to their house. After showering I exitedly noticed that the father of the house already started cutting the 360 pieces of steel. I wrote a “Indonesian Visa & Research permit procedure for Dummies Guide” to help you find your way when you have to do al of this by yourself (updated in 2011, PDF). I just want to let you know that me and my bagage arrived safely in Jakarta after a 23hr trip. The last 6 days (with much more to come) Wawan his daugher and I spend many hours arranging documents to get my Research Permit for the next 6 months. This picture gives you an idea of the daily panorama that I have to observate. When I finish this procedure I will publish a manual how to get this visa, because the procedure has changed after 15 december 2007. Sampai lagi! Posted byMarjolijn April 25, 2008 Posted inVISA1 Comment on Hello Jakarta! Finally! 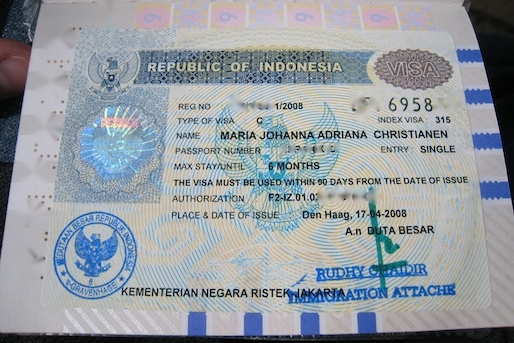 23 hours before my flight left to Jakarta I got my VISA! It was a really stressful last week and without Pak Wawan helping me, I would never had made it in time before my flight left. So for all of you curious about how this procedure worked out for me here is a manual (but be aware that rules and things change frequently) to arrange a VISA to travel into Indonesia. The manual of how to get your KITAS (which you need to stay for limited stay) will be coming soon after my first week in Jakarta. 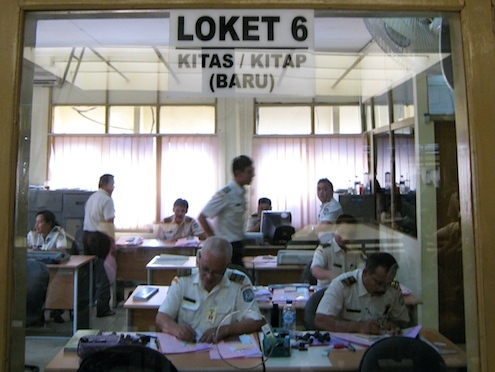 From 15-12-2007 official permits for foreign researchers pursuing research activities in Indonesia, will be issued by the State Ministry for Research and Technology and not by LIPI anymore. 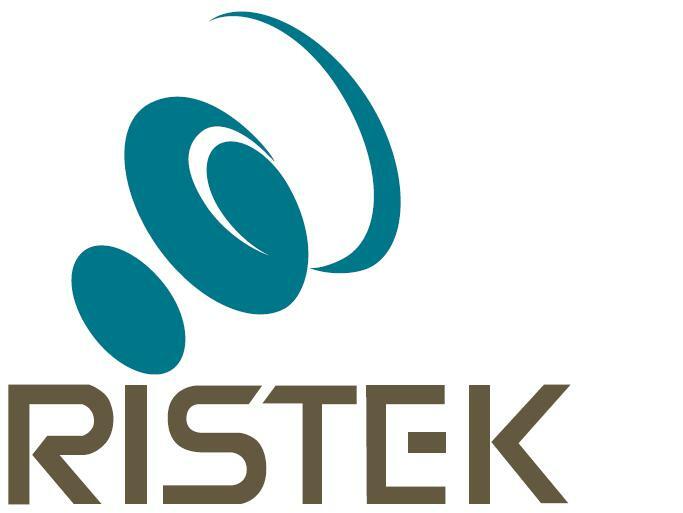 You will have to arrange all documents which are stated at RISTEK’s website. The most time consuming one is getting the letter from your counterpart in Indonesia (this took most of the time for me), stating that your sponsor supports the cooperation research, the title of the project and contact person. The best way to arrange this is to find an Indonesian contact person who will go to the offices in person to ask for the letter. The safest way to get the letter is to ask your contact person to scan and email it to you. The official version of this letter for me got lost in the mail system, but the fax was sufficient at the embassy. Once a month somewhere in the middle (it was 12th of March for me), the coordinating team will discuss all the research proposal and decide if they will approve it or not. Be sure to send your application way before the ½ of the month. After this meeting I had to wait for 3 weeks to hear the outcome of this meeting by email luckily it was -> approved! 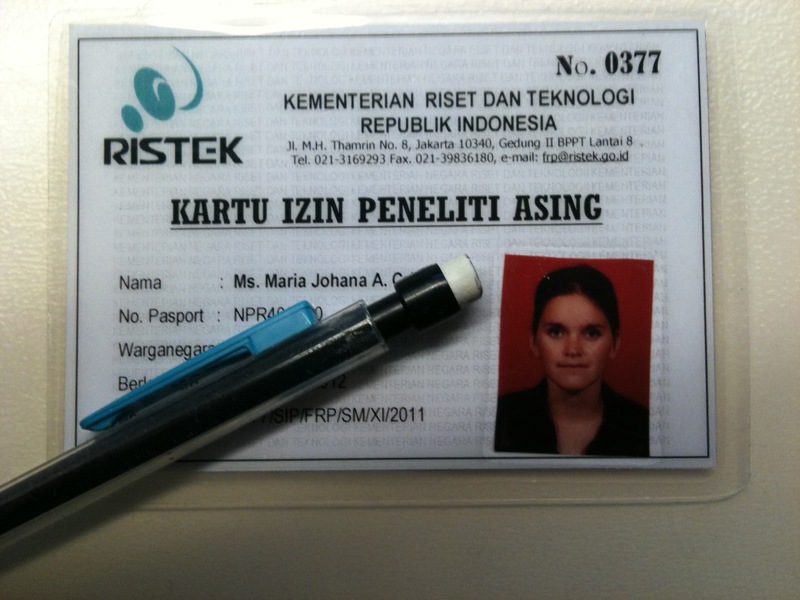 Now RISTEK will have to send your application to Immigration Jakarta, this will take at least 10 (working) days. Although, if you are in a rush, you can ask for the express procedure (300.000 rupiah). Don’t count on this last procedure, I asked for the express procedure but it still took 10 days. They asked me to send CV, copy of the passport and pass photo by email. After 10 days -> approved! In my case the Embassy did not receive the fax so I could hand over my own copy. My contact person in Jakarta (Wawan) was so kind for me to check personally at RISTEK, that really speeded up the process of faxing. A letter will be prepared, and you get your paper back, which you should hand over at the visa counter. Pay 100 euro’s (take cash with you in case the PIN is defect, otherwise you will have to search a ATM like I did) and come back in 4 days. I did this in 2 days (in stead of 5) and the staff of the Embassy was very kind to make an exception so that I could still catch my flight. Day 5. Pick up your passport, WITH VISA inside -> celebrate, fly to Indonesia and prepare for 2 more weeks of visa procedures when in Indonesia. Together with Liesbeth Pierson we spend a day looking to seagrasses at a totally different perspective. The results from 6 tropical seagrass species are published at vitual classroom biology but you can get sneak preview of microscopic views of Cymodocea serrulata below. In this movie you can see the transport of chloroplasts over a cytoplasmatic strand. A detail of on of the 40 shoots of T. hemprichii the rhizome is cut to 3 cm and a stainless steel nut is connected to the shoot to keep it on the bottom of the glass collumn. 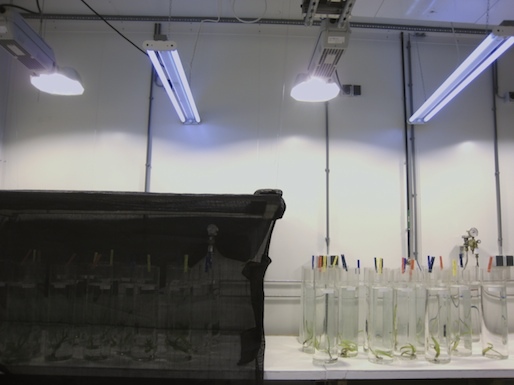 The first results of the PAM measurements on photosynthesis are very promissing! Unfortunately the preparations of my field campaign to Derawan is more pressing at the moment, so analysis has to wait. And now lets hope that the rest of the imported seagrass from Indonesia will survive and grow new shoots for the next experiment. 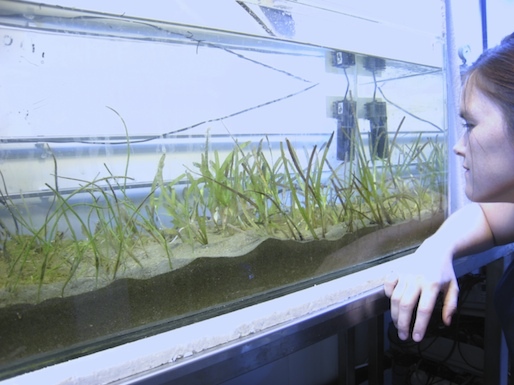 Here are some tips on growing seagrass in aquaria. Posted byMarjolijn December 16, 2007 Posted inFieldwork, SeagrassLeave a comment on My first experiment! To get permission to do my fieldwork in Indonesia I’m trying hard to get al the required documents together. These are all the documents that you need to apply for a research permit. Rapidly growing economic development in SE Asia has led to increased human activities, particularly in coastal areas (L. Kamp-Nielsen et al. 2002). Among others, deforestation, fish and shrimp culturing and increasing inhabitation results in strongly increased nutrient and sediment loads to coastal waters, which threaten the economically and ecologically important seagrass beds, and have caused their almost complete disappearance in many areas (FT Short et al. 1996, R Constanza et al. 1997, A Balmford et al 2002). We hypothesise that seagrass systems are characterised by strong positive and negative feedbacks, which make them liable to sudden and irreversible state transitions. 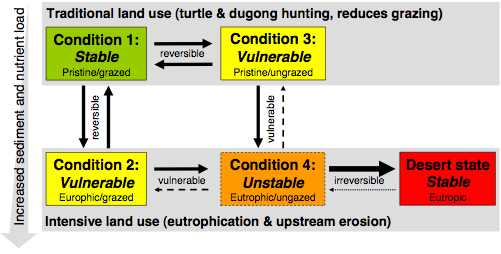 Based on existing knowledge and pilot studies, our main overriding hypothesis is that nutrient load, sediment load, hydrodynamics and grazing on the seagrass are the most important drivers that push the seagrass ecosystem into different functional states (figure 1). Our research is directed towards testing this hypothesis, and understanding the basic feedbacks. This is of great scientific importance, and has important implications for practical management. Within the present proposal, we focus on the interaction between nutrient loads, changes in transparency and grazing for the productivity and health status of seagrass beds. Figure 1. Schematic representation on how seagrass meadows may degrade in response to land-use, and which shifts are easy/difficult to reverse. Results in the literature show that in relatively oligotrophic waters subject to increased nutrient and sediment loads, complex interactions between (stoichiometry of) nutrient additions and sediment enrichment govern the growth and dynamics of seagrass. We propose to test the hypotheses that (1) direct toxicity of nitrogen to seagrass occurs at environmentally relevant concentrations in tropical seagrass beds; a positive feedback may arise because increased toxicity decreases growth rate, and thus increases vulnerability to nitrogen loads. 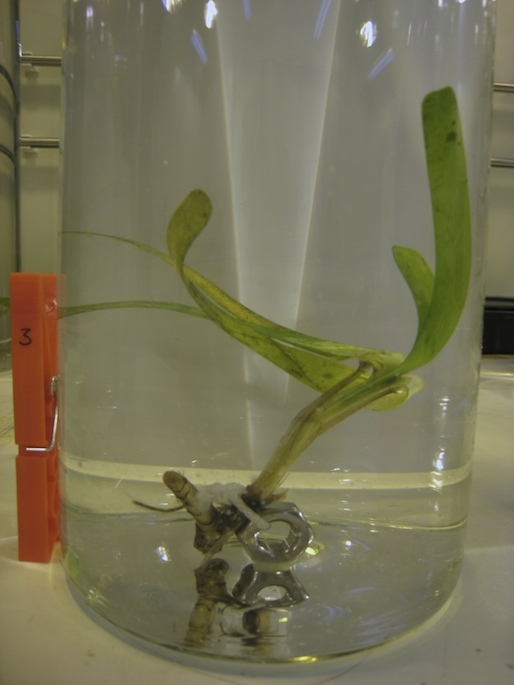 ; (2) strong grazing may protect seagrass meadows from overgrowth by epiphytes, increasing critical loads; (3) under increased organic loading of the sediment, iron deficiency may push the system in a state of increased sulphate reduction, a positive feedback may arise through sulphide toxicity effects and decreased aeration of the rhizosphere. Figure 2. Locations of field research within the Berau Delta, East-Kalimantan, Indonesia. 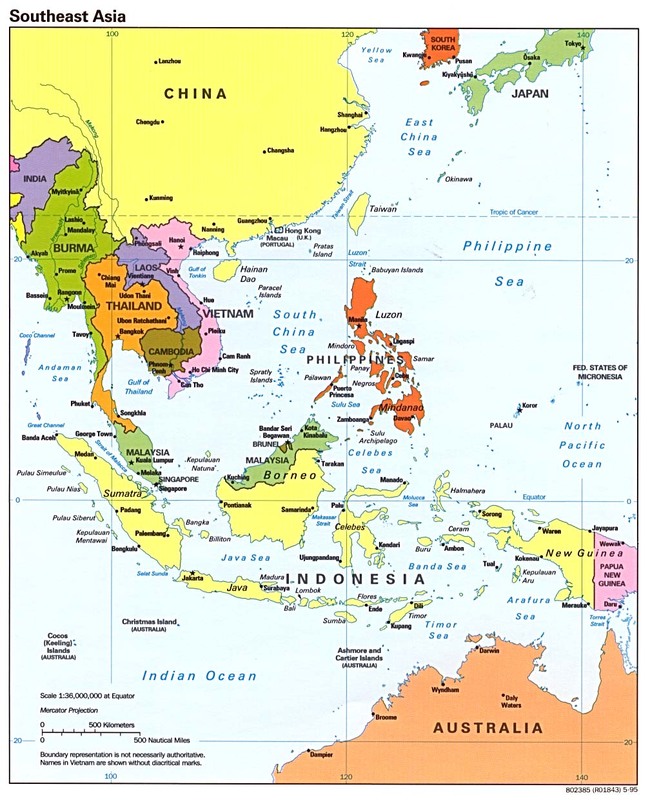 The research in The Netherlands will be carried out at the Radboud University Nijmegen at the Institute for Wetland and Wetland Research and at the Netherlands institute for Ecology in Yrseke at the department of Spatial Ecology, in close coorperation with the Research Centre for Oceanography of the Indonesian Istitute of Sciences (LIPI). 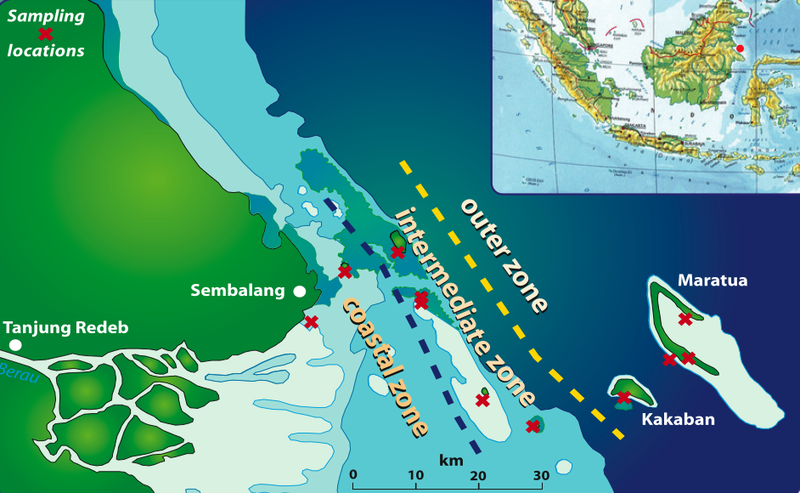 The fieldwork will be carried out in Indonesia, where studies will be conducted at locations with varying degrees of nutrient and sediment loading (Figure 2). The fieldwork is focussed on the Berau delta in East Kalimantan cluster. 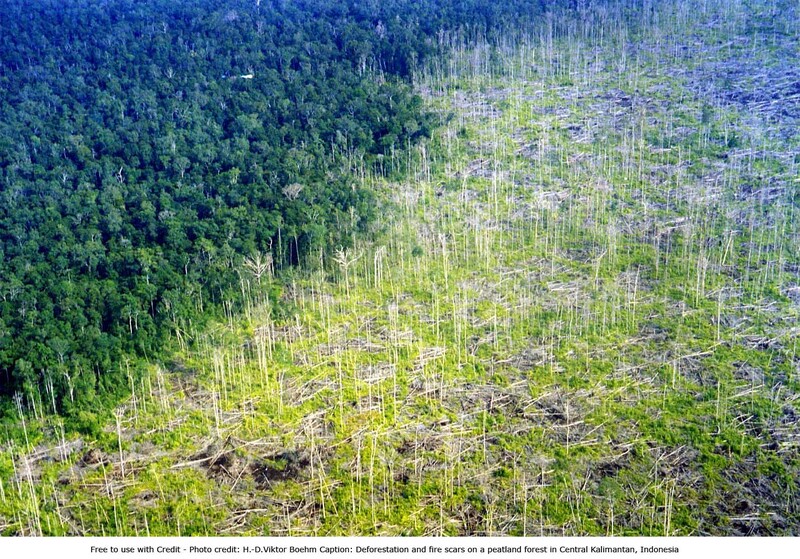 The Berau delta forms a watershed with very low logging intensity in the upper watershed, good forest cover and a very low level of mining operations. Mangroves in the Berau delta are still largely intact. Welcome to Lamun.wordpress.com. “Lamun” means “Seagrass” in Bahasa Indonesia and is the main subject of my PhD project. The tropical seagrass which I’m going to study in the Berau delta in front of the island of Kalimantan, Indonesia. I will add more information on my project and other nice things to know very soon, so come again!